Led Zeppelin is a band that much like Ozzy-era Black Sabbath, in that I can recognize and respect their contributions to and influence on hard rock & heavy metal, but they’ve never really been a favorite of mine. Maybe it’s from overexposure on the radio TO THIS DAY? When you hear so many of their songs over and over day after day on the radio, they tend to lose their punch and impact. My thoughts on this album are the same as my thoughts on the band: some great hard songs, but too much bluesy/folksy/country music for me. And can I say that I HATE “Misty Mountain Top”? It’s such an annoying song. The titling of this album is a mess. 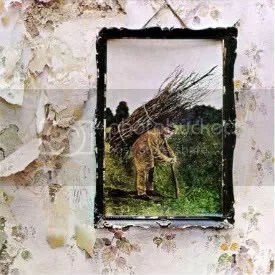 To most people the world over, it’s Led Zeppelin IV, because it’s the fourth Zeppelin album and like the previous three, it did not have an official title. But Atlantic Records has sometimes referred to it as Four Symbols and The Fourth Album. It’s also been called Zoso, Runes and Untitled. I already knew about Zoso, but Runes and Untitled are news to me. Page & Plant just call it “the fourth album”. This is the only Zeppelin album I own, though I do own the Remasters compilation box set.